First-year students tour the Dominican Republic during the Office of First Year Experience's first -ever Study Abroad program for freshmen. 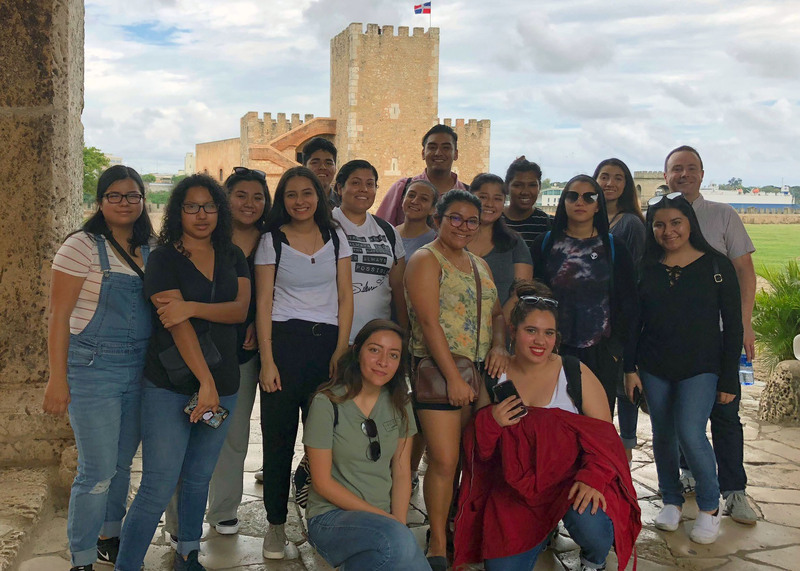 From the bustling streets of La Paz, Baja California Sur to the beaches of Santo Domingo, Dominican Republic, groups of first-year Cal State Fullerton students were able for the first time to study abroad and bring home a renewed sense of community and love of learning. The Office of First Year Experience (OFYE) partnered with International Programs and Global Engagement, and the Educational Opportunity Program (EOP) to offer “Global Titans,” a week-long study abroad program available to first-year Summer Bridge students enrolled in University 100. Nearly 50 students, divided into three separate groups, traveled to Mexico and the Dominican Republic for a week in January. They engaged in community service projects, learned about each country’s culture, and trekked through locales often unseen by tourists. Global Titans was funded by Graduation Initiative 2025, the President’s Strategic Fund, the Center for Internships & Community Engagement (CICE), and EOP. Because of its timing (between semesters) and the relatively low cost, the program provided an inclusive opportunity for students, who might not otherwise be able, to study abroad. Roberts said her experience in La Paz made a direct impact on her becoming more involved and social on campus, including applying to join Camp Titans this summer. That impact, said Dr. Mary Ann Villarreal, Associate Vice President for Strategic Initiatives and Interim Director for OFYE, is one of the main goals of the program. Villarreal said Global Titans was inspired by a similar program at Georgia State University, which has shown to have had a positive effect on first-year retention—a key factor in increased graduation rates, which is the aim of California State University’s systemwide GI2025. In addition to learning more about the history and culture of the countries they visited, students also learned to become more independent. “For many, it was the first time students budgeted their money, bought their own food, navigated airports, bought plane tickets, and got passports,” said OFYE Special Projects Coordinator Rosemarie Enriquez, who, along with IPGE Program Coordinator Abigail Segura, sent information to students, provided workshops, and answered application questions. Salvador Reyes, who was in one of the groups that visited the Dominican Republic, said his entire perception of the world changed in just seven days. Sign up for the Office of Academic Programs Newsletter!